I never really thought much about Milkweed until this summer when I started seeing several beautiful Monarch Butterflies in my yard. 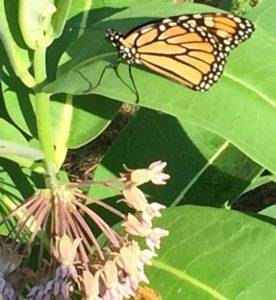 I posted a picture of the Monarch on facebook and my sister Kelly told me that Monarch’s love Milkweed, and where there is Milkweed there will be Monarchs, as it is a food source for them. 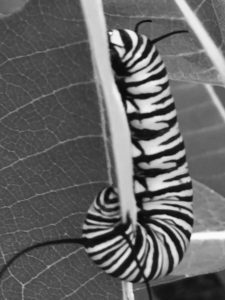 It is the milky white sap of the Milkweed that the Monarch caterpillars eat that makes them undesirable to predators allowing the butterflies to flourish. I Have read that Monarchs are on a decline by as much as 90% in the last decade due to the loss of Milkweed from farmers to homeowners using pesticides. As a child I remember the silky white feather substance of the milkweed which enthralled me whenever I ran across the big green pods. It was an unusual enjoyment of breaking them open and running the silkiness through my fingers while it blew away in the wind. It is my understanding that this silky substance is now being used as filling for pillows and insulation and contains latex. Milkweed is now being commercially grown and harvested for this purpose. Who knew. Every year I use to pull out the Milkweed as it grew up throughout the spring and summer in both the front and back yard when the shoots first started to appear randomly wherever they took root. This year I did not have time to work in the yard much and as the Milkweed grew I started seeing these really beautiful unusual lavender and white rubber ball like flowers growing on the plant. I was fascinated by them. I would touch them each evening as I walked up the sidewalk to the breezeway when I got home. I would talk to others about them. To me they are beautiful and exotic! I also have several out in the backyard by the house in an area that I let grow wild. These beautiful unusual flowers appear before the pods appear. I never knew that they were Milkweed. I stopped having my lawn treated with chemicals about twelve years ago when my son was young. It is not as lush and green as it used to be but oh the bees, moths, butterflies and birds I have are plentiful. I also harvest the dandelions each spring and make a wonderful dish with cherry tomatoes, onions, turmeric, garlic and chili powder. I have a very large garden full of Chives that blossom with small beautiful white flowers this time of year creating an environment for nectar loving bees, and butterflies which are thrilling to watch as I soak up the sun on my lounge chair. Here we are in mid-September and the Milkweed flowers and pods have come and gone. The Milkweed plants in the back of the house have dried up and died from the hot sun but the ones in the front by the walkway are still coming up and what am I seeing on the leaves but big beautiful yellow and black Monarch caterpillars climbing the stems and eating the leaves. It is my understanding that the Monarch Butterflies are in their fourth generation of life here and the ones that will emerge after the metamorphic change will enter their fourth cycle of life and will fly south to warmer climates for the winter and return again in the early Spring to lay their eggs on the Milkweed and start the cycle again.